Two of the four Israeli soldiers killed in the truck-ramming attack in eastern Jerusalem were American citizens. The soldiers were buried Monday in separate cemeteries a day after the attack on the promenade in the Arnon Hatnatziv neighborhood. Erez Orbach, 20, of Alon Shvut in the Etzion bloc south of Jerusalem was an American citizen, Haaretz reported, citing a U.S. Embassy official. He holds U.S. citizenship through his mother, according to the newspaper, citing a family member. Orbach was the oldest of six brothers. Shira Tzur, 20, of Haifa, had American-born parents, according to Haaretz, which cited a soldier in her unit. The others killed were Yael Yekutiel of Givatayim and Shir Hajaj, 22, of Maale Adumim. The soldiers were on an educational trip along with several other groups. They had just gotten off a bus in the promenade when the driver of the truck, a resident of the eastern Jerusalem neighborhood of Jabel Mukaber, drove into them, reversing back over the bodies after he had hit them. 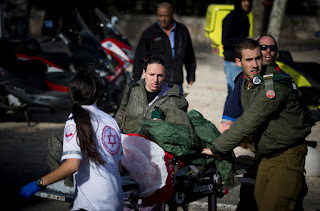 Prime Minister Benjamin Netanyahu visited some of the injured soldiers on Monday morning. One reportedly remains in a life-threatening condition, breathing with the help of a respirator and facing more surgery.